Well, it’s hard to believe we’re at this point already. The time is rushing steadily by at a worrying speed. 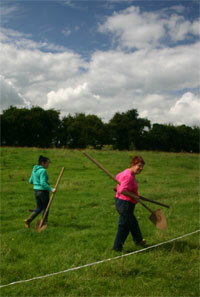 However, today we are joined by some additional volunteers: Gary and Niamh, both of whom are postgrad students in UCD. Their arrival is very timely and is greatly welcomed. 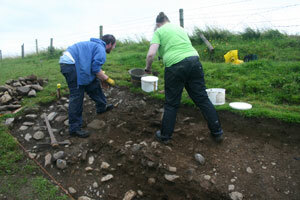 In Trench 4 Kieran, Eimear and Deirdre put in another amazing day bringing the ditch down. They are beginning to find the bottom of the feature which is comparable in depth to the other two ditches in Trenches 1 and 3, if not a bit bigger. 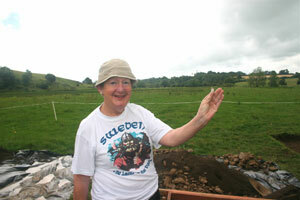 Eimear is almost the full depth of the ditch as it stands at the moment, and there is still a bit to go. There is water at the bottom of this ditch – we did have quite a wet morning after a wet week-end and the water level in the river is noticeably high compared to last week – and we wonder whether this is the level of the water-table or even the level of the water in the river. Given that the material beneath the cultivation soil into which our ditch is cut is almost pure gravel, this is at least possible. There aren’t likely to be any major impermeable barriers between the location of Trench 4 and the river. 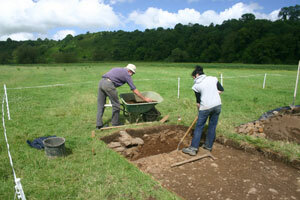 I am promised that the edges of the ditch will be beautifully sculpted tomorrow and that the bottom will be reached. Hopefully the water levels will fall overnight to facilitate this! 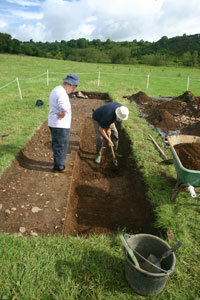 In Trench 3 Matt and Darren continued to explore the fills of the ditch and the bank in that area. As reported on Friday this ditch is more substantial than was anticipated earlier in the dig and now looks as if it will be the same sort of dimensions as the outer enclosure ditch uncovered in Trench 1. We are looking at a ditch up to 4m across at the top with a depth of up to 1m. Work went well here during the day (despite everyone losing an hour or two in the morning because of the misty but persistent rain which prompted an early tea break). The edge had been already established on the west side of the ditch and attention was then focused on the east side of the trench to see if an equivalent edge could be established. During the late morning some very large cobbles were encountered in the cutting leading to suggestions of a possible revetment or wall-like feature on the face of the bank. Further investigation revealed that although these were substantial stones, they were not sitting in courses as we would expect with a wall but they did seem to be sitting on a berm or a shelf on the face of the ditch. Are these a deliberate feature or is this just where some of the stones from further up the bank finally settled. Maybe we’ll find out more when we dig a little more. Because of these stones obscuring a possible edge on the eastern site of the ditch, the lads decided to follow the known edge and peel off the fill from the west side instead. This paid off because early after lunch they found the base of the ditch. I know there s a myth about lightning striking twice but it looks as if it struck twice at Rossnaree! Last week we were very lucky to recover a cow’s mandible from the base of the ditch in Trench 1 which is (hopefully) ideal for radiocarbon dating. 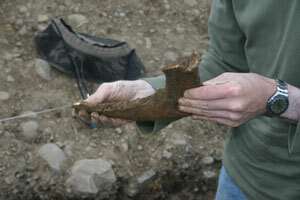 Well, out of the bottom of the ditch in Trench 2 what did they find but an almost complete cow’s rib. This was in almost exactly the same location in the ditch and the two deposits suggest that their placement was a deliberate action and a feature of the site. It is surely too much of a coincidence to be anything else. 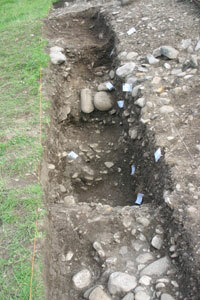 I wonder what we’ll find in the base of the ditch in Trench 4. This find is great, again for dating purposes. If it proves possible to get a radiocarbon date from this bone sample, we will have a date for the use (close to initial construction) of the site. It is possible that the various enclosures around the site were constructed at different times so we would have comparative dates telling us how much time elapsed between the construction of the two ditches. Alternatively, the two may have been constructed at the same time which has another set of implications about the planning and possible functions of the site. Are these deliberate deposits or are they just representative of waste disposal practices? So much food for thought. Finally, in Trench 1, Gary and Niamh took the task of taking down the layers filling the ditch in the southern side of the trench. These are being bulk sampled for macrofossil remains. This means that large samples of the soil are being kept (between 5 and 10 litres) for processing at a later date in the hope of retrieving a variety of environmental indicators like seeds, charcoal and other plant material. These will be separated and retrieved from the samples through a technique known as flotation where the soil samples are added to water and the vegetable fraction floats to the surface and can be skimmed off and can be later analysed and identified by specialists giving important information on the environs of the site and how they looked and were managed at the time the site was in use. Not as exciting as finding cattle ribs perhaps. Unfortunately it will take some time before the results of this particular exercise are known. We are now at the end of our second week; day 10 out of a total of 20. Am I a glass-half-full or glass-half-empty person? I think that the rate of progress has slowed a bit in Week 2 relative to week 1 but this was inevitable. We had a larger crew in Week 1 and a lot of material was moved – desodding and topsoil. The nature of what we are dealing with now means the work now has to take a slower pace. We are trowelling a lot more rather than mattocking and shovelling. 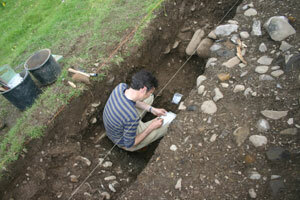 We also have to stop digging at intervals in order to record the features we uncover. However, there have been important successes. 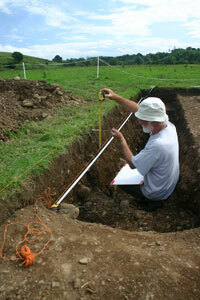 Nothing that has been found so far on site suggests that the enclosure is anything other than Neolithic in date. Although there has been no pottery yet (which is closely dateable because of their fast-changing shapes and decorative styles over time), there has been a lot of flint pointing to prehistoric and probably Neolithic or Early Bronze Age construction and occupation. Anyway, the news for today is that first of all, the weather turned out much better than we were expecting. After the near wash-out on Thursday we had been expecting blustery showers all day. The wind didn’t materialise and there was no rain at all. As a result we managed to get some more work done. The success of the day was that in Trench 4, Kieran and Deirdre were really getting to grips with the nature of the enclosure ditch. The edges had been clearly established and they began to take down the fill. 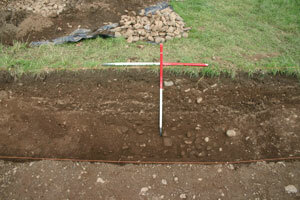 Although the ditch was not bottomed we are definitely in the right place and the base is not far off. Digging finished up at a level characterised by a layer of field stones which must have spilled in from one side or the other. The fact that they are so deep down in the fill suggests that this event may have taken place relatively early in the life of the ditch. This layer may be comparable to the ‘spill/slump’ layers of stones identified in Trenches 1 and 3 and the stones may have come from a bank feature that once would have stood along the inner edge of the Trench 4 ditch. There is no sign of such a bank today in any of the data we have – aerial photographs, LiDAR, and the various geophysical outputs – but it is likely that there once was one in this area comprised of the spoil dug from the ditch. There are very few finds from this part of the site; although they are there the numbers are extremely small compared to Trench 1 and especially Trench 3 close to the core of the site. Perhaps there wasn’t much activity in this part of the site. Even today, this is an area subjected to regular flooding during winter and would have been the same in the past. It would not have been a wise location to construct houses or other structures. Perhaps the stony layer so far down in the section suggests that there was less concern in maintaining this part of the site compared to the sections of ditch in Trenches 1 and 3. 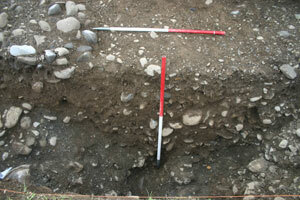 The fill of the ditch looks promising for the preservation of macrofossil plant remains and perhaps pollen. Snail shells were also noted in the fill here and soil samples will be taken to examine the specific species present as snails (molluscs) are very sensitive indicators of the environmental conditions in an area in the past. 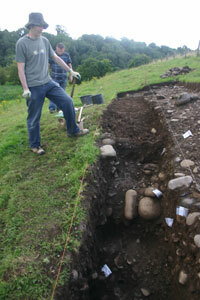 Work also continued in Trench 3 where Matt and Darren continued to explore the fills of the ditch there. We had been speculating as to the probable depth of the ditch here. One set of geophysical data was suggesting that it was not as substantial as the outer enclosure ditch encountered in Trench 1 while another set of data was saying that it was comparable in size. I had thought that it may be less substantial as it was an inner enclosure but the digging here today suggests that it may be as big as the Trench 1 ditch. A considerable depth has already been reached and the signs are that it is still going down. More to be revealed as we continue early next week. 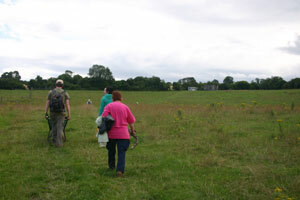 We also had a number of visitors to the site today: Gabriel, Steve, Aimée, Kim and Emmet from U.C.D. 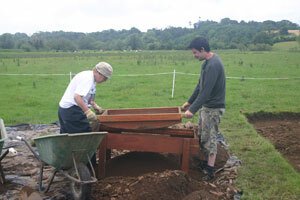 as well as Bryn who is visiting home from Australia and Michael who helped out on site in the first week of the dig. They reminded us once again of what a wonderful place we are working in. I think we may have begun to take our surroundings a bit for granted, and of course the weather wasn’t helping. We Irish have a ludicrous saying suggesting that we actually like the auld bit o’ rain now and then. Today might have qualified for the ‘soft day’ categorisation but there’s no way any of us on site were particularly pleased with it today. 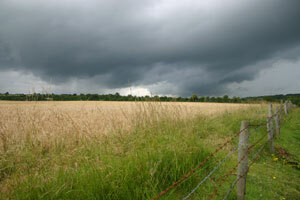 There were numerous heavy showers but the weather couldn’t make up its mind as to whether it was coming or going. The result was a lot of wettings and some very stop-start work. Anyway, the one good thing about the weather today was that some of our crew were not able to make it to site today because of other commitments. So not everybody had to be subjected to a soaking! The work that we did manage to get done was limited but it nonetheless pushes us a little further towards our ultimate goal. 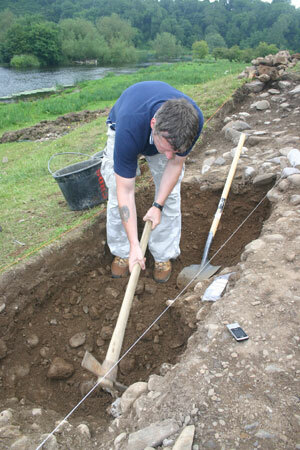 In Trench 4, Kieran, Eamonn and Deirdre continued to peel the cultivation sol off the top of the fill of the enclosure ditch. Very few finds were coming out of the material being removed but Deirdre’s sharp eyes picked out a fragment of a rock crystal flake (sorry no photo). This is very small-less than half the size of your little fingernail-but is distinctive and unusual. Although more difficult to work into tools than flint (and harder for us archaeologists to recognise) it is clear that materials other than flint were often used by people in the Neolithic. In some cases it seems simply that where there was a shortage of good quality flint, people used other materials like chert and quartz as ‘second best’ alternatives. However, it is also possible that the materials chosen for toolmaking reflected the intended functions of the tools or reflected the identities of the people making the tools. We all have the good crockery at home for when visitors call. Similarly, craftspeople today often use unusual or distinctive materials as a sort of trademark. Perhaps this was going on in the Neolithic as well. 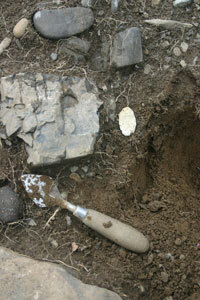 The flake fragment we found is distinctive because it is a type of quartz which is almost transparent, like glass. This quality would not have been lost on the Neolithic people. In Trench 1 we continued to take out the fill of the gully and we also drew the north-facing section exposed when we excavated the enclosure ditch. We also plotted the locations of the magnetic susceptibility soil samples we took yesterday. We managed to complete these various jobs by lunchtime between showers and then we transferred over to Trench 3 where there is also a bank and ditch feature. 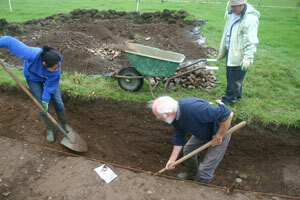 The plan was to start to take down the material filling the ditch in the same was as in Trench 1. We unfortunately didn’t get much done because of the rain but we did notice a larger number of bone fragments compared to Trench 1, reflecting the position of Trench 1 closer to the ‘core’ of the site. Can’t decide whether the weather forecast was accurate; I think it was today. A blustery day is forecast tomorrow with scattered passing showers. I think we may be able to cope with that. Day 8: Every cloud has a silver lining. The day got off to a very unpromising start weatherwise. There had been rain overnight and when we reached the site at 9am, light drizzle was gradually becoming more persistent. We suited up in our wegear, hoping this was only a shower, and walked down to the site. 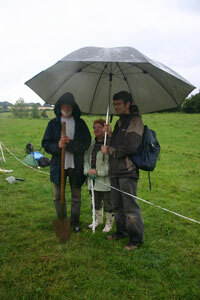 The rain got heavier as we went and stopped us getting stuck in to the work. We sheltered under a combination of hawthorn trees in the hedge, taking time to speculate on their age, and Deirdre’s very functional fishing umbrella. This should perhaps become standard issue on all archaeological sites! However, just as we were saying ‘five more minutes and we’ll go up and stick on the kettle’ the sky brightened a bit and the rain actually stopped. We split into our teams and started. In Trench 4 the team began to take down the next spit of cultivation soil overlying the ditch which we had identified in the geophysics. It seems that the cultivation soil is relatively deep in this area because there is a very distinctive corrugated pattern to the field surface indicating ridge-and-furrow cultivation with the ridges set about 5m apart from each other. Additionally, the geophysics from this area is a lot less distinct than that for the field to the west where the main part of the enclosure is located, perhaps suggesting a lot of agricultural disturbance. Deirdre proves the sieve works. 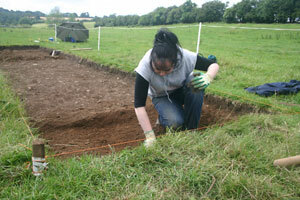 The Trench 4 team was joined by our new recruit, Eimear, and experienced digger and research student based in UCD, who is very welcome. 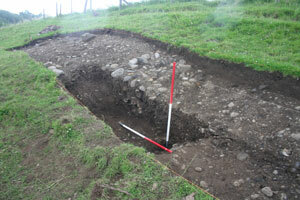 Ditch fills section face, Trench 1. In Trench 1 the other team cleaned up the section face of the ditch that was exposed yesterday and took a close look at the various fills of the ditch. Six separate fills were identified, indicating the various stages involved in the gradual silting up of the ditch to its present surface level. While it was once almost 1m deep, it now is only about 15cm deep. A lot of material washed down the slope and off the tops of the adjacent banks over time. We also took another series of soil samples from the section faces for magnetic susceptibility analysis. 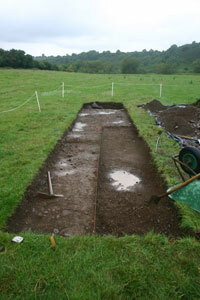 Matt began to look at a smaller ditch to the west of the main enclosure ditch. This shows up in the geophysics for the area but appears to be a much less substantial feature and it also follows a slightly different line to the main ditch. Our feeling at the moment is that it may be a much later drainage gully which was coincidentally placed close to the prehistoric ditch. 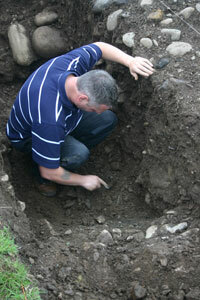 The fill is very clean silty clay with no finds of any kind. 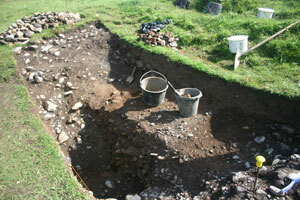 Meanwhile, by the afternoon, real progress was being made in Trench 4. 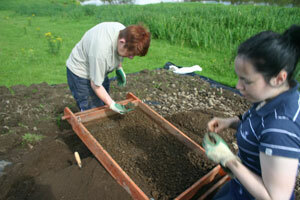 The diggers there had found the base of cultivation soil. 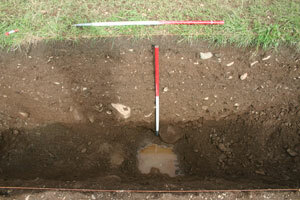 Disturbed soil gave way to a layer of more gravelly soil which in turn gave way to more compact clean gravelly material. They now have a good understanding of the depth of disturbed soil that must be removed from the top of the trench before the first intact ditch fills are encountered. So, no dramatic finds or discoveries made today, but despite the unpromising start, a good solid productive day followed. The weatherman had warned of rain spreading into Munster and south Leinster by midday spreading to all areas over the afternoon so we were apprehensive about when this weather would actually arrive. The day was not as bright and as sunny but was still dry. The big news for the day was that we were joined by reinforcements in the form of Deirdre, a veteran of many previous excavations including Graeme Warren’s dig at Belderrig and Geraldine and Matt Stout’s dig at Site M, Knowth. A valuable addition to our small team. Work focused on two areas today: Deirdre and Eamonn under Kieran’s supervision began to work down through the topsoil/cultivation soil in Trench 4, the site of the geophysical survey work on Saturday. Ultimately, the excavation of this trench will be a test of the accuracy of the various techniques we used during that survey. The other area of activity was in Trench 1, continuing the explorations started yesterday tracing the extent of the ditch of the outer enclosure. Work went very well and by lunchtime, Matt had found the bottom of the ditch and by the end of the day he had found the sides of it as well, at least on one side. The ditch turned out to be around 90cm deep, pretty much the depth indicated in the ERT section carried out over this area some time before. This is a very good result for us excavating the site, but also for Kevin, who has hard evidence to show how well the equipment works. As if that wasn’t enough, out of the very base of the ditch, at 4.40pm, almost when the day was done and it was time to pack up to go home, Matt made another discovery. 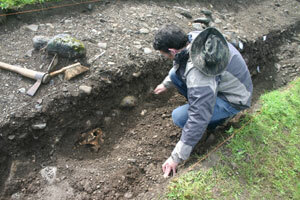 At the very base of the ditch, he uncovered an intact cow’s mandible. You may wonder why you should be excited about this. Granted, it is not the most exciting find and you’re highly unlikely to find one of these in any museum display. The main value of this find is that it can be scientifically dated using radiocarbon dating and an independent scientific date for the site can be established. 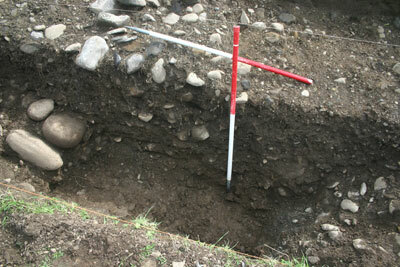 It was in the perfect location for establishing an accurate date; right at the bottom of the ditch. This means that the bone must have made its way into the ditch very soon after the ditch was dug, presumably while the site was in use. 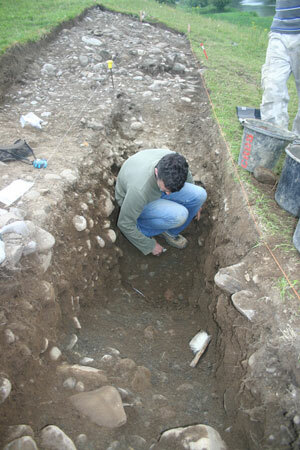 If the bone was further up in the fill of the ditch, it could have made its way into the ditch some time later and thus would not be a reliable indicator of the earliest use of the site. 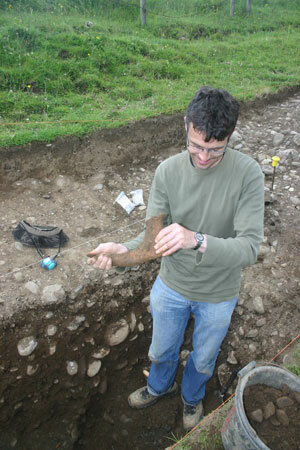 Matt displays his cow's mandible (lower jaw). Furthermore, it seems that the bone may have been deliberately placed at the base of the ditch because it was found in a small ‘slot’ feature right at the base. 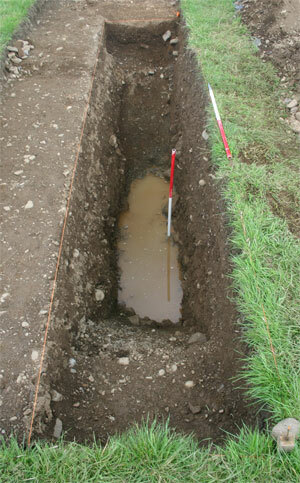 This would further connect the bone to the initial digging of the ditch and the earliest use of the site. It seems inevitable that there will be some rain over the next couple of days. Hopefully not too much!